How about writing a play about a British leader manipulated into leaving a peaceful alliance with Europe and go it alone in barbarous isolation? Oh, hang on—Shakespeare did one. 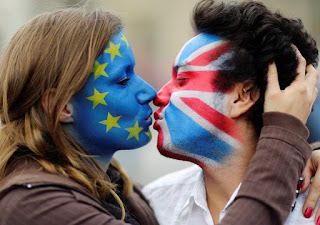 As the Brexit negotiations descend into pandemonium (my own in-the-wrong-party MP Heidi Allen is a leading Tory rebel), I hereby beg my theatre friends to stage Shakespeare’s Cymbeline, topical as never before, more than 400 years since it premiered. Shakespeare based Cymbeline on the historical British King Cynobelinus, whose reign began in the first decade CE. 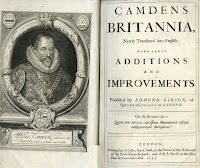 The bard admired Cynobelinus’ coins as drawn in the 1607 edition of William Camden’s Britannia, before which the historical Roman province of Britannia had never before been understood as a physical, material reality. When James I/VIth came to the throne in 1603, he projected himself as the Roman Emperor Augustus, who, after a long period of civil war, brought Rome to peace, alliances, and unity. 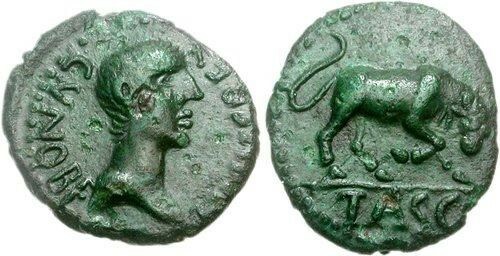 Cymbeline, educated on the Continent, is a happy ally of Rome. His xenophobic new wife wants to secure Brexit, kill him and Assume Total Power with her yobbish son Cloten. In the prescient Act III scene 1, she goads Cymbeline into insulting Caius Lucius, the virtuous and polite Roman ambassador. Anglo-European war is declared. Our peace we’ll ratify; seal it with feasts. Ere bloody hands were wash’d, with such a peace. At the annual conference of the Historical Association in Stratford on Avon last month, I was honoured to be invited to give a keynote lecture on Shakespeare’s later Roman plays. 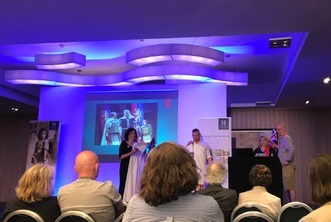 Along with wonderful colleagues working with me to persuadeHistory teachers to introduce Ancient History to their schools/sixth-formcolleges, we performed parts of this play substituting EU flags and Union Jacks for the insignia of Augustus and Cynobelinus Rex. Cynical laughter abounded. A recent Hollywood movie tries to topicalise Cymbeline by representing Rome and Britannia as two rival motorcycle gangs. 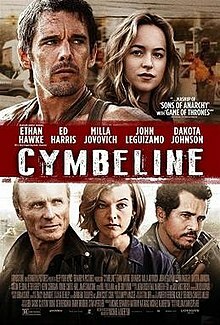 Despite the usually superb Ed Harris as Cymbeline, it is dismally bad. But contemporary Britain has stumbled into providing this classic drama with a painful sudden relevance. I wish we could follow Shakespeare, put the 2016 referendum behind us in Act III, and move on to the joyous, cosmopolitan finale. I’m pleased by Jeremy Corbyn’s announcement that he supports the reunification of the Parthenon Marbles in their rightful Athenian home. I vote Labour but I’m also a proud member of the British Committee for the Reunification of the Parthenon Marbles, and have blogged about this issue before. 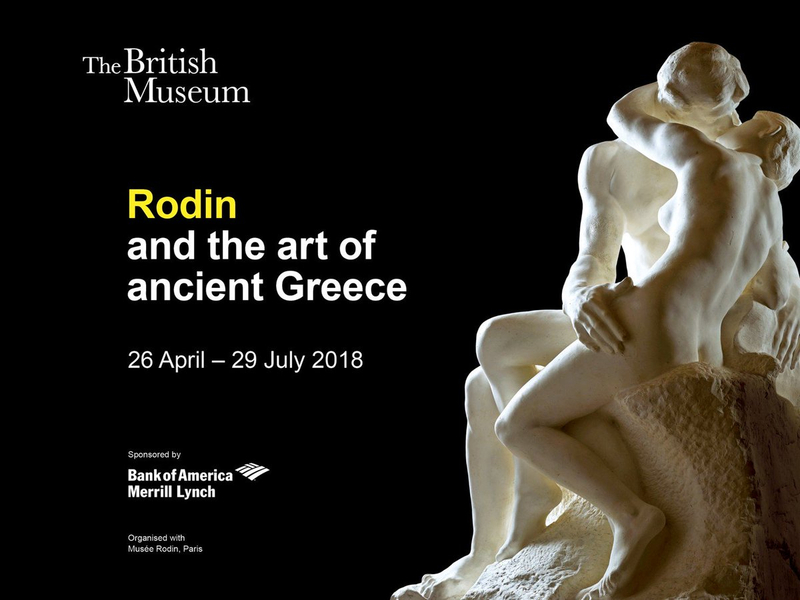 I’ve been saddened by the gushing responses across press and media to the current Rodin and the Art of Ancient Greece exhibition at the British Museum. Few journalists have seen the cynical motives underlying the jamboree. Suspicions that opinion-management was at work should have been aroused by the mounting pressure on museums worldwide to acknowledge the colonial rapine involved in amassing their collections. Even louder alarm bells should have been rung by the identity of the financial sponsor, Bank of America Merrill Lynch. 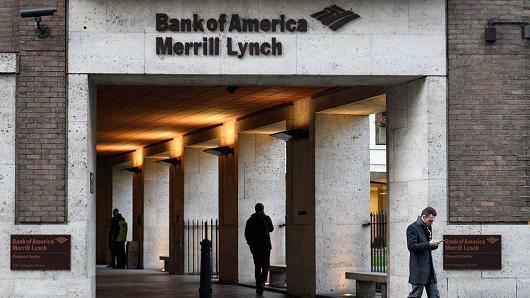 BAML has its own desperate PR offensive at the moment—a bid to mend its ravaged reputation only weeks after having to hand over $42 million in settlement for defrauding customers between 2008 and 2013. 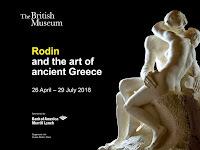 The two premises the Museum’s spin doctors ask its viewers to accept are contentious: (1) that without a visit to the British Museum’s amputated fragments of the art of the Parthenon and Acropolis Rodin might not have become the great sculptor he was (why couldn’t he have gone to Greece? 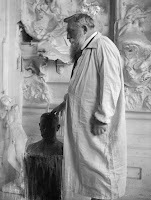 He visited Italy to study Michelangelo); (2) that ‘sculpture’ always means freestanding individual works conceived, displayed and revered as autonomous works of art, like Rodin’s ‘The Kiss’ or ‘The Thinker’. The category apparently excludes magnificent public monuments like the Parthenon and the other temples of the Acropolis, which combine serial images in different material media aesthetically celebrating an entire community’s aspirations, spirituality and political identity. Alas poor Rodin—I am sure he would have been appalled at such blatant ideological abuse of his own work, especially given that many of his most famous statues, including ‘The Kiss’ and ‘The Thinker’, were originally designed as part of a public monument, ‘The Gates of Hell’, inspired by Dante’s Inferno. They were commissioned by the French State as the portal to a new museum of the decorative arts which was in the event never built. "Fallen Caryatid Carrying her Stone"
My own favourite Rodin sculpture is his ‘Fallen Caryatid Carrying her Stone’, originally designed for the top of the left pilaster of ‘The Gates of Hell’. 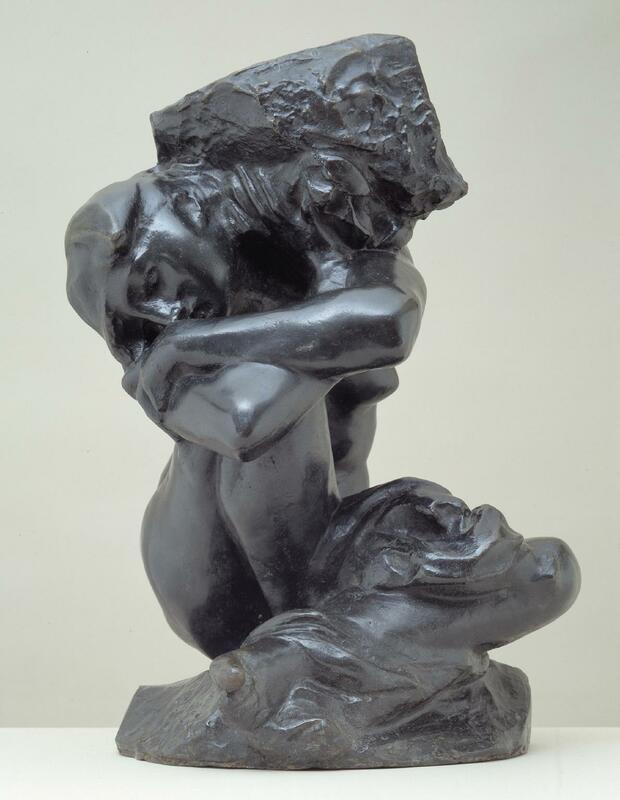 I like to think that that the shocking sense of deracination and lapsarian despair she induces in the viewer was Rodin’s response to the miserable isolation of the solitary Caryatid from the Athenian Erechtheion stranded in London’s British Museum. 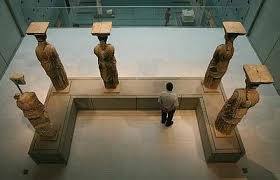 She's two thousand miles away from her sisters in the Acropolis Museum, named the The Best Museum of the World in a 2010 British poll. Let’s look beyond the media hype so expertly engineered by the Rodin exhibition, and use it instead as an opportunity for a serious public conversation about allowing her and the rest of the Athenians’ Acropolis sculptures to be reunited at last and seen as part of the Gesamtkunstwerk for which Pheidias & Co. originally designed them.